If you come in Mallorca for cycling, you definitely should not miss to cycle one of the best cycling routes in the world. 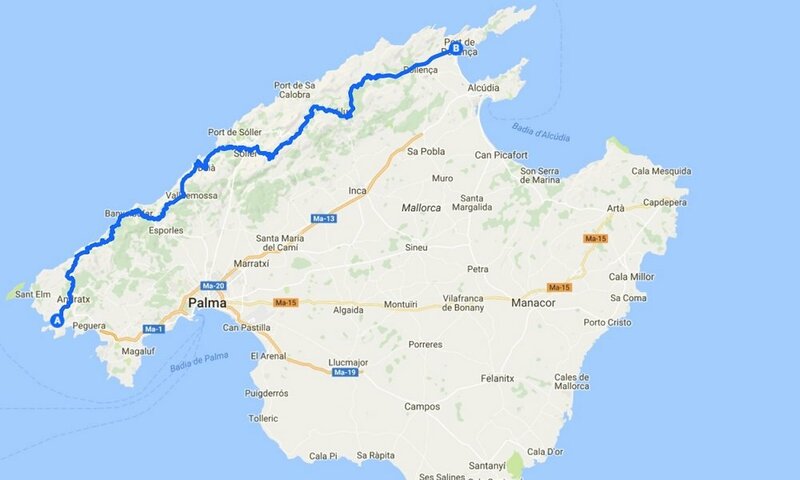 121km long way leads from Port de Andratx to Port de Pollenca. First part of the route is hilly path along the mountains with nice sea view. There is small town Sollér in the middle part of the route. It is hidden in valley of the mountains, near Port de Sollér. It is recomended to have a lunch break here, because then you will climb one of the longest and heaviest hills in Mallorca. Nearly 14 km with 6,2% of climb. You may need bike lights on the top of the hill because of tunnel. Then the hardest part is behind you and you will cycle more or less down the hills. Behind the tunnel you will ride around two mountain lakes Cúber and Gorg Blau and through one more short tunnel. Between the peaks Coll de sa Batalla and Coll de Femenia is monastery "Santuari de Lluc" which is also nice for the break.